Buying a piano, or, as it is referred to, a traditional or acoustic piano, is not something that is purchased without a specific need or use. Depending on the need, the purchase can be minimal, or expensive. Starting a child on piano lessons would require a less expensive ‘upright’ until they show a talent and desire to continue learning. However, a professional musician or concert pianist would look towards purchasing a high quality upright or grand piano, of better quality, touch and sound, and of course, considerably more expensive. All pianos can be traded ‘up’ as a need arises. The only time that there is a financial loss is when no one wants to continue playing. Thus, to save money it is best to buy the best for the least. 1 Make it a point to visit a few showrooms and become familiar with various manufacturers, and the names and qualities of each make. Ask questions, and get brochures and make notations on a pad regarding each. 2 Play each of the pianos, or have the salesman play pieces as well as major and minor scales. Listen carefully to hear that each piano does have a slightly different tone. Some are mellow, brilliant, loud or soft. Each individual piano produces a different tone and unique sound regardless of style. Take into consideration the size, especially if your room is small. The grand piano ranges in size from under five feet to nine feet (a concert grand). The term “baby grand” is often used to describe pianos around the 5′ size. 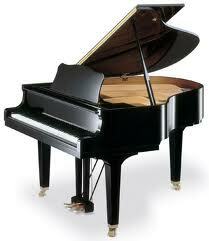 A grand piano has a fast touch and is more responsive and powerful than an upright. Many people enjoy playing grand pianos more than upright pianos. However, some larger professional-quality uprights can have equal or better tone quality than many small grands. Grand pianos all have a horizontal action, and upright pianos have a vertical action that can be above or below the keys. Uprights range in height from 36 to 51 inches. All of them require the same amount of floor space, about five feet by two feet. The largest of the uprights is the studio piano, which is 44 inches or taller. This is a type which is becoming quite popular. Uprights, 39 to 42 inches tall, are referred to as consoles. No longer built is the spinet which was 36-37 inches high. Manufacturers discontinued these because they were not a great sound and the action configuration was very inferior to consoles and studios. However you might find a used spinet or one in stock that may be good for the beginner and fit nicely into the room. 3 Take an experienced pianist with you when you are ready to buy; get their opinion about your choice of each piano. Realize however that tonal preference is very subjective and your opinion is the most important when it comes to the sound you like. Listen to low, middle, and high notes. Ask about and learn to understand what makes a certain piano more desirable than another. Keep in mind however that your “experienced pianist” is going to recommend what they like, not necessarily what you like. They may also want to steer you to a brand they already know. The brand you have heard of may not be the best choice. Your taste and your budget are the most important elements. Find out which pianos are often used by music institutions such as conservatories and universities particularly if you can afford a very expensive piano. Such hubs of music instruction know through experience some pianos which are of good quality and relatively trouble-free. Ask music professors and professional musicians for recommendations. Recognize you may be steered toward those brands who have made long term investments in marketing to these institutions to make their products most familiar. Piano technicians are another source of information about pianos and may have thoughts on which piano to choose when you narrow down your selections. Look for a member of the Piano Technicians Guild in the yellow pages. Understand, that a technician will probably be oriented toward pianos that are easier to work on. 5 Try out several pianos of each brand. Different models are typically manufactured with vast quality differences. It is similar to a car brand. The Boston piano is made from much lower quality components than a concert grand piano by Steinway even though they are sold by the same co. Often, depending on the model and price range, there are surprising individual differences. One thing you will notice is how the keys feel when you press them down. Some are stiffer than others, and some are looser. This is called touch. You will want to find the piano feels good to your fingers and and sounds good to your ears. 6 Inspect the piano carefully, including every part, as described. The Back: The posts should be heavy and strong enough to provide adequate support in proportion to the rest of the piano. The Soundboard: A wooden board at the back of the instrument which translates the vibrations of the strings into the “tone” of the piano. The soundboard is one of the vital parts of the piano. A cracked soundboard can make a piano sound unappealing. Plate: An irregularly-shaped piece of cast iron bolted to the back of the frame. It holds one end of the piano strings, and anchors most of the twenty tons of pull exerted by the taut strings. Treble and bass bridges: Another of the piano’s vital organs. These long pieces of hard maple are attached to the soundboard, transferring to it the vibrations of the strings. When piano dealers refer to the “strung back,” they mean the parts just discussed plus the strings. The bass strings are wound with wire to add weight and reduce the frequency at which the string vibrates. This allows the use of relatively short strings to produce deeper notes. The working section of the piano is called the action. There are about 7,500 parts here, all playing a role in sending the hammers against the strings when keys are struck. Piano hammers are formed of one or two layers of felt forged onto a wooden hammer molding under tremendous pressure. If a dealer talks to you about a 9-pound hammer as opposed to a 12-pound hammer, he means the weight of the sheets of felt that were used to make the hammers. The piano keys rest in the key bed, a perfectly flat well in the front of the cabinet that keeps the keys level. Each key is balanced by a center pin, and “bushed” with fine wool for silence and proper clearance. The “ivories” are not ivory anymore, but a fine molded plastic that won’t crack or turn yellow. The black keys are made of a similar material. Most pianos have three pedals, but most pianists need only two. The sustaining pedal on the right lifts the dampers (which in a resting position prevent the strings from vibrating) away from the strings so that the tone is sustained after the keys are released. The pedal on the left, called the damper, mutes the tone by shortening the distance the hammers travel or by shifting the action slightly so fewer strings are hit. Many pianos have a third pedal in the middle for sustaining bass tones only. On most grand pianos and some uprights, the third pedal is a sostenuto, which sustains selected tones at the pianist’s discretion. Finally, there’s the cabinet, that handsome piece of furniture which will take a prominent place in your decor. Modern cabinets are made of core stock overlaid with thin veneers of fine furniture wood. Many grains and finishes are available and modern finishing techniques assure excellent appearance and easy care for years. Buy a piano made by a reputable company with a good production volume, and make sure they offer a manufacturer-backed warranty. Ask about their trade up policy. If you can find a piano dealer with a written 1 year “trade-up policy”, you might be better off purchasing there! 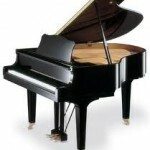 Visit several showrooms as each showroom sells different named pianos. Ask questions about tuning the piano, and whether the dealer can recommend a good tuner familiar with the brand. Some piano showrooms will even offer piano lessons in their showroom itself. Some have monthly piano concerts, with cheese and crackers and other snacks. Attending is a great idea; it is free, an evening or afternoon out, and a way to actually hear how the piano sounds. Expect to buy the best piano you can afford and fit in your house. Or get a quality piano but do not buy the most expensive. A student starter piano will suffice, because you can always ‘trade it up’ for a better one if your child enjoys and wants to continue playing. Ask the salesman about their trade up policy. Usually the first piano bought for a beginner is an upright. Do not expect it to have the touch or sound of grand, but the tonal quality and sound will suffice and will encourage the beginner to learn and practice. Consider a used piano from a dealer. Many keep used pianos in stock as rentals, but they’re happy to sell them, too. There can be differences between individual pianos of the same brand and model. Find out if the piano you receive will be the one you have tried and heard. Used-pianos can be a great deal but it is difficult for the inexperienced to know a good instrument from a piece of junk. Always take a piano tuner with you when purchasing a used piano to inspect to make sure the soundboard is not cracked or damaged. Even a very cheap used piano can be a great learning instrument if it plays well and sounds good and has been maintained well and tuned often. Keep in mind that, if you are a professional, or an experienced musician, you might be listening to and looking at your piano for a long time so make sure it meets every one of your requirements and needs. Pianos depreciate very little over time. A used piano built ten years ago, and maintained well will still be worth almost as much as a comparable new piano. Beware of piano stores going out of business sales unless you get a warranty from the manufacturer, and have had the piano parts inspected by a piano tuner. The only maintenance that has to be taken care of, is to have the piano tuned on a regular basis and has nothing to do with the place you purchased it from.